Chicago is referred to as the “Windy City”, a moniker with many explanations referring to its people (not the weather), and one that is earned by the effects of skyscrapers funneling wind down into the streets. Chicago is only marginally windier than the average American city—Boston is the windiest—with average wind speeds of 10 miles per hour. Chicago also experiences frequent gusts along the lake front, resulting in cooler and wetter air throughout Chicago’s waterfront communities. Lake Michigan not only affects the wind in Chicago, but also the general climate for all four well-defined seasons. Classified as humid continental, visitors here experience damp and mild springs with peak precipitation in May and June, hot and humid summers, pleasant autumns, and cold snow-white winters. The best stretches of time to visit Chicago, when the weather is the most agreeable, are late April through June when temperatures average 59 F/15 C to 80 F/27 C and September through October when a range 64 F/18 C to 76 F/24 C is typical. If you’re willing to brave the muggy climate in the summer, with average heats summiting at 84 F/29 C, you’ll be rewarded with several high-profile festivals: Pitchfork Music Festival, Lollapalooza, Chicago Pride Festival, Taste of Chicago and more. In the winter months, temperatures range from 32 F/0 C to 37 F/3 C, making this time of year the least desirable to endure apart from the illustrious outdoor Christkindlmarket, which celebrates German and European culture through crafts, noshes and festive cheerfulness. Chicago is a popular traveler destination, no matter what time of year, due to the plethora of interminable happenings. When planning a trip to the Windy City, here is what you need to know. Chicago summers are hot, humid, and sunny. Have an umbrella on hand as impetuous rain can occur. Expect to sweat throughout most of July and August. While Lake Michigan does have an effect on Chicago weather patterns in the summer, it is not as prevalent as it is during the spring. If winds puff in from the east, temperatures may be slightly cooler along the lake front. Be cautious of heat waves and prepare by hydrating and seeking out shade. June, July and August have all experienced three-digit record highs. What to Pack: Don’t leave air conditioning without a bottle of water, sunblock and a hat. You’ll want to bring shorts, light-weight tops, sandals, and sunglasses. Autumn is an ideal time to visit Chicago, when the leaves change colors, restaurants update their menus to reflect belly-warming fare and fall beers, and folks seek out apple picking, pumpkin patches and corn mazes. The weather is no longer stifling and muggy, and time spent outside feels indulgent—especially along the lake shore or the famous Magnificent Mile. What to Pack: Bring a sweater, mid-weight jacket and a scarf and you’ll fit right in and be comfortable. Snowfall varies throughout winter, ranging from extremes of 9.8 inches to 89.7 inches, with an average of 36 inches annually. Most winters have several light snow accumulations throughout the season with lake-effect snow playing a role. Lake Michigan has a warming effect during the winter, which makes temperatures somewhat less frigid on the lakefront than in urban areas more inland. Every few years, Chicagoans are thrust into a heavy snowstorm where over 10 inches of snow can accumulate. What to Pack: To survive a Chicago winter, you’ll definitely want to bring a heavy coat, a warm hat, gloves, a scarf and water-resistant snow boots. If spending significant time outdoors, you may want to consider wearing snow goggles. 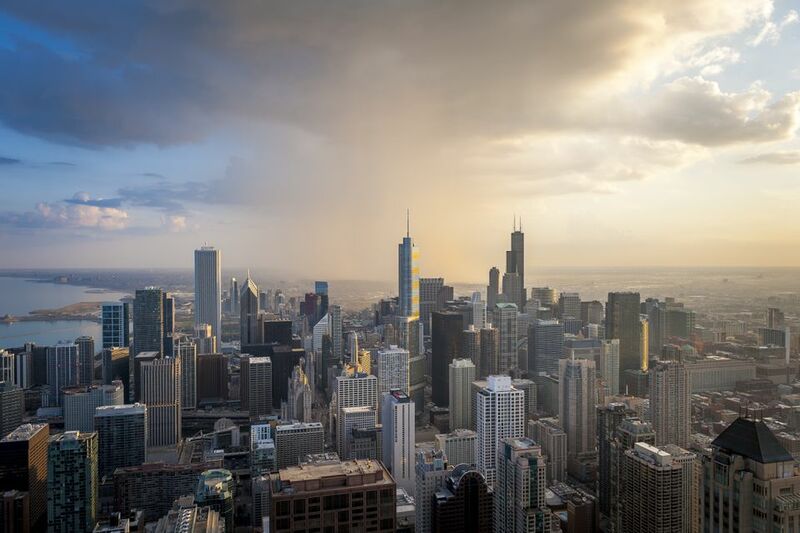 Visitors in Chicago experience 3.65 inches of rain in April and 4.3 inches in June. The temperatures this time of year vary greatly with a record high in June of 104 F/40 C and a record low of 13 F/-11 C in April. Expect winter-like weather to persist early spring through April, occasionally including snow. May and June are quite pleasant, and arguably the paramount months of the year to visit Chicago. You’ll notice flowers popping out of the ground and green buds sprouting on tree branches. Lake Michigan is relatively cold in the spring, as warm temperatures are sluggishly heating up the hefty body of water. Wind takes a noteworthy part in the weather along the shoreline, creating vast differences in warmth for lakefront neighborhoods versus the rest of the Chicago area. What to Pack: Layers are the optimal way to go in spring. The earlier chunk of the season necessitates a warmer jacket while the later part requires more light-weight options. Bring a windbreaker and an umbrella. Weather in Chicago is directly affected by Lake Michigan and can vary greatly month to month, season to season. Expect a wide diversity in temperatures and cloud cover throughout the year.